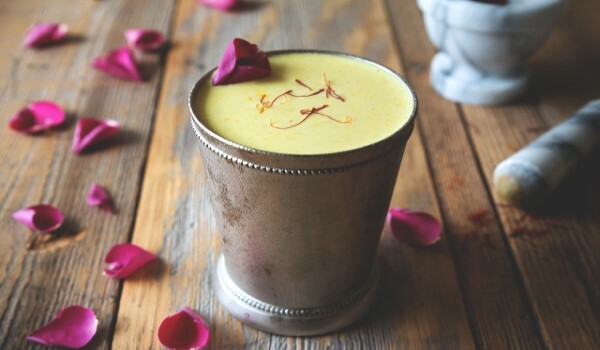 Zafrani Sherbet is an absolutely delicious drink with the rich flavor of saffron. Learn how to make/prepare Zafrani Sherbet by following this easy recipe. Soak saffron in little milk and keep aside. Heat milk in a thick-bottomed vessel and bring to a boil. In a thick-bottomed pan, boil milk and then simmer it for ten minutes till thick. Now add sugar, cardamom powder and saffron to the milk and simmer for another five to six minutes till creamy. Turn off the heat and add almonds and pistachios and mix. Refrigerate. Pour out the sherbet in four tall glasses and add one scoop of kesar ice cream.